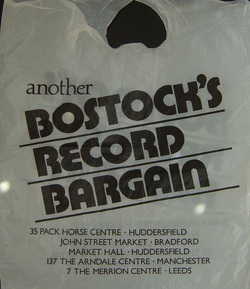 When I was fifteen I got a job at a clothes shop in Bradford and on the market there used to be a market stall called Bostock’s, and they used to do twenty records for a quid, American imports, with no centres in. At this time I used to buy records, even if I didn’t know what they were. Bostock’shad a chain, one in Huddersfield, one in Leeds and they had a lot of US and Canadian cut-outs, so I started buying all the Four Tops, Smokey and Stevie Wonder records that hadn’t come out over here. Anything, basically, on that label. Every Saturday for about a year I used to go toBostock’s in my lunch hour come back with a bag of forty records, and my entertainment for that night was sitting down and playing the A and B-sides of these records and having my parents moan at me about saving money. Extract from Ian Dewhirst Interview DJ History. (Feb 25, 2014) Carl said:I was the very last customer at the Leeds store in the early nineties. I was buying a copy of Rush -Power Windows on cassette when the staff informed me of this.Sad to see the general decline of local record stores. Digital downloading & streaming is about the last punch in the guts for record shops but good to see that a certain class of consumer still values the joy of buying a physical format - Long live the surviving stores. (Feb 15, 2013) jonathan bostock said:That was my uncles chain of shops, called him Gerry. He and his son, Paul started it off in Bradford. (Jan 25, 2013) kendo nagasaki said:the Leds branch was in the Merrion centre, just opposite the infamous 'Phono' nightclub/dive. it ran up till the early 90s. they stock a lot of rubbish but it was well worth a visit as you could come across some real gems! (June 8, 2015) I was manager of the shop at the time it closed. By then it was a subsidiary of a london company "Dynamite Records". The owners name was Marc Fisher. Unfortunately they decided to launch their own label of cds, albums and cassettes but they didnt take off and their subsequent outlay on tv advertising meant the end for the once popular chain. Happy memories though :-) John Bairstow.